In his classic A Geography of Oysters, Rowan Jacobsen forever changed the way America talks about its best bivalve. Now he does the same for our favorite fruit, showing us that there is indeed life beyond Red Delicious-and even Honeycrisp. While supermarkets limit their offerings to a few waxy options, apple trees with lives spanning human generations are producing characterful varieties-and now they are in the midst of a rediscovery. From heirlooms to new designer breeds, a delicious diversity of apples is out there for the eating. Apples have strong personalities, ranging from crabby to wholesome. The Black Oxford apple is actually purple, and looks like a plum. The Knobbed Russet looks like the love child of a toad and a potato. (But don't be fooled by its looks.) The D'Arcy Spice leaves a hint of allspice on the tongue. Cut Hidden Rose open and its inner secret is revealed. With more than 150 art-quality color photographs, Apples of Uncommon Character shows us the fruit in all its glory. 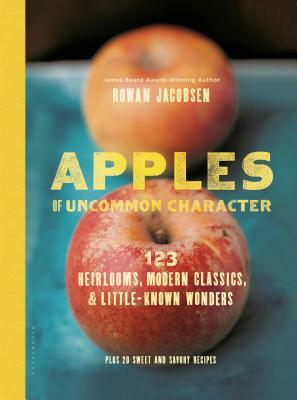 Jacobsen collected specimens both common and rare from all over North America, selecting 120 to feature, including the best varieties for eating, baking, and hard-cider making. Each is accompanied by a photograph, history, lore, and a list of characteristics. The book also includes 20 recipes, savory and sweet, resources for buying and growing, and a guide to the best apple festivals. It's a must-have for every foodie. Rowan Jacobsen is the James Beard Award- winning author of A Geography of Oysters and Fruitless Fall. Jacobsen's writings on food, the environment, and their interconnected nature have appeared in the New York Times, Wild Earth, Harper's, Eating Well, and Newsweek. He lives in rural Vermont with his wife and son.